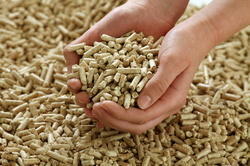 Our product range includes a wide range of biomass pellet. Pellets are a common type of Biomass. Biomass is any biological material that can be used as fuel - including Grass, Corn, Wood as well as other forestry and agriculture residues. Pellet fuel is a renewable, clean-burning and cost stable home heating alternative currently used throughout North America. It is a biomass product made of renewable substances - generally recycled wood waste. Using wood pellets for heat, in freestanding stoves, fireplace inserts furnaces and boilers. In short, pellet fuel is a way to divert millions of tons of waste from landfills and turn it into energy.